Maine Crafts Association members all have unique stories to tell regarding how they were introduced to the organization and its surrounding community, whether it was through word of mouth from other craft artists, stumbling upon us at a fine craft show or other promotional event, or through our partnership with Haystack Mountain School of Crafts at our annual Haystack Weekend. For skilled metalsmith Jason Morrissey, it was the latter, when he attended a Haystack weekend in 1998, overlapping with his education at Maine College of Art where he earned a BFA with a concentration in Jewelry and Metalsmithing. In Jason’s industrial, busy metal studio located on the outskirts of Downtown Portland, there is a superabundance of beauty, both finished and in progress. His tables and workspaces are adorned with an intricate display of textures, shapes, and patterns, all on their way to becoming masterful pieces of the fine metalwork his name has come to represent. Jason’s background in the creation of both jewelry and glass are apparent in his mosaics and other textured, patterned steel, where he stacks and combines layer after layer, producing flawless symmetry. Born and raised in Vermont, Jason came to Maine to attend MECA, where he later taught other beginner metalsmiths and glass artists. His mentors were professor and knife maker William Fiorini, with whom he studied with at Haystack and was introduced to pattern welding; goldsmith, author, and educator Tim McCreight; and many other fine craftspeople from Maine and beyond, including educators at Glasgow School of art in Glasgow, Scotland where he studied abroad as a junior in college. After nearly a decade of teaching, Jason has embraced life as a student, furthering his craft at both the New England School of Metalwork and through the American Blacksmith Society. 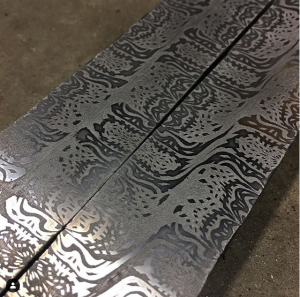 Currently an American Blacksmith Society apprentice, Jason is working towards his Journeyman status, and intends to continue on to become a Master Smith.Focusing mostly on pattern welded steel and Damascus, Jason enjoys learning to incorporate new and exciting techniques into his stages of production. 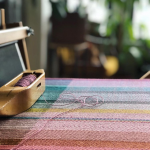 A common theme for Maine Crafts members is keeping the process interesting while still maintaining a high standard for their levels of productivity. Jason intends to do this by utilizing his patterns in different functional craft objects such as high-end flatware, kitchen tools, and more. 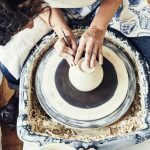 It is extraordinary watching Maine makers handle difficult, stubborn materials with expertise and finesse; and seeing the finished products is just the icing on the cake. 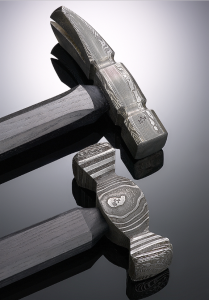 View a selection of Jason’s one-of-a-kind hand-forged knives, available for sale at Maine Craft Portland. To learn more about Jason’s background, process, and offerings in various media, visit his website here.